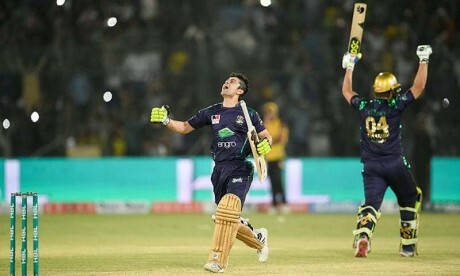 Karachi, Quetta Gladiators has outclassed Peshawar Zalmi in the final of the Pakistan Super League season 4 and it has become the champion of the PSL4. Quetta Gladiator Becomes PSL 4 Champion. Quetta Gladiators has achieved the target of 139 runs on the loss of two wickets, which was set by Peshawar Zalmi. The opening batsman of Quetta Gladiator, Ahmed Shahzad played wonderfully and he scored 59 runs not out and he played the important role in the victory of his team. Rilee Rossouw scored 39 runs and he remained not out while Shane Watson scored 7 runs and Ahsan Ali made 25 runs. Wahab Riaz was the only bowler of Peshawar Zalmi, who got only one wicket but there was no other bowler, who showed impressive performance in this match. With the victory of Quetta Gladiators, there were the slogans in favor of Quetta and the victorious team ran in the stadium and they responded to the slogans of the spectators. Sarfaraz XI got tremendous encouragement from the spectators. The final match of PSL 4 was played in National Stadium and the captain of Quetta Gladiators, Sarfaraz Ahmed won the toss and he invited the Zalmi to play first and he preferred to field first. The bowlers of Quetta Gladiators showed tremendous performance and no batsman of Peshawar Zalmi stayed on the crease to face the tremendous bowling of Quetta Gladiators. The batsmen of Peshawar Zalmi could not play fast and they tried to hit hard but they lost their wickets. Peshawar Zalmi managed to score only 138 runs in the allotted 20 overs. Muhammad Hasnain of Quetta Gladiators young pacer and he bowled good and he claimed three wickets for 30 runs in just 4 overs. The opening batsmen of Peshawar Zalmi, Imam ul Haq and Kamran Akmal started their inning well but Imam could not make good runs and he was caught on just 3 runs. Kamran Akmal also sacrificed his wicket for just 21 runs and Zalmi lost the third wicket at total runs of 68 runs when Sohaib Maqsood was out just for 20 runs. The left hander, Umar Amin has shown some resistance and he scored 38 runs. Nabi Gul made 9 runs, Pollard 7, Sammy made 18 and Wahab Riaz scored 12 runs, while Jordan did not open his account. Husnain got three wickets, Bravo 2 and Fawad and Nawaz got one wicket each. 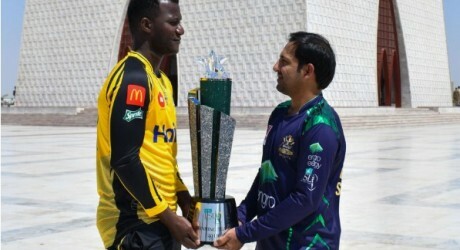 Both the teams of Quetta and Peshawar reached in the final of this event for the third time. Both the franchise teams faced each other in the 2017 edition, in which Peshawar Zalmi got the honor to become the champion of this great event. Now Quetta Gladiators won this title beating Peshawar Zalmi in the final of this great event.